Baby Powder From Decades Ago Caused Cancer, California Jury Finds The woman said she used J&J talc-based products in the 1960s and '70s and later developed mesothelioma. The pharmaceutical company says its product is safe and plans to appeal. 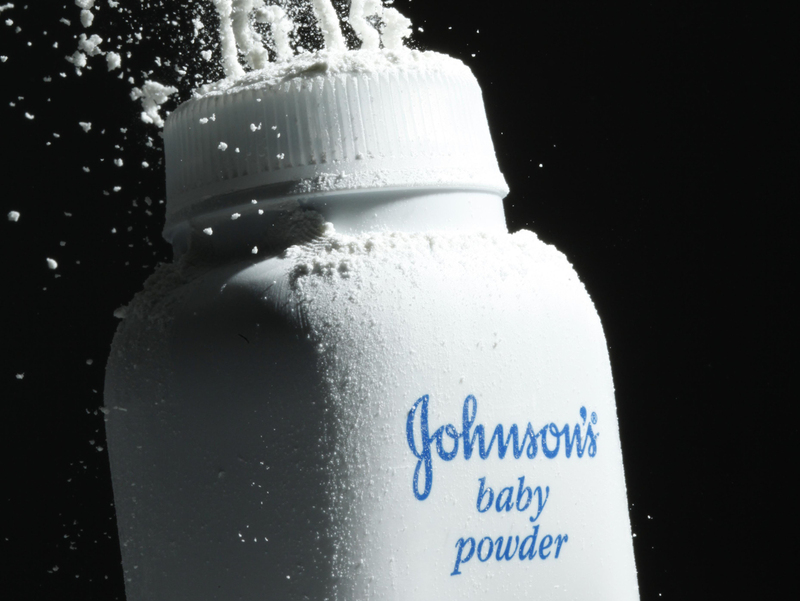 In this file photo, Johnson's baby powder is squeezed from its container. The plaintiff, Terry Leavitt, said she regularly used two J&J products in the 1960s and '70s containing talc. In 2017, she was diagnosed with mesothelioma — a kind of cancer linked to asbestos exposure. After two days of deliberation, the jury found that J&J talc-based products were defective and caused Leavitt's mesothelioma, and that the company had failed to warn consumers about the risks. The jury, in the California Superior Court in Oakland, awarded Leavitt and her husband $29.4 million in damages. J&J faces thousands of lawsuits alleging its talc-based products harmed consumers. This suit is the first to go to trial since December articles by Reuters and The New York Times alleged the company feared for years that its baby powder might contain asbestos. J&J denies that its talc powder contains asbestos or is responsible for health problems. J&J said it would appeal, pointing to "serious procedural and evidentiary errors," Reuters reported. "The jury verdicts are not medical, scientific or regulatory conclusions about a product," it said. In December, documents came to light showing J&J worried for decades that its baby powder might be laced with small amounts of asbestos, which can occur naturally underground near talc. A company executive in the 1970s warned that J&J's talc mines might not be free of asbestos. Some of its talc products sometimes contained materials that "might be classified as asbestos powder," The New York Times reported, quoting an internal company memo. Recent cases have focused on talc's link to mesothelioma, but many additional cases allege the powder has caused ovarian cancer. All told, the pharmaceutical company faces more than 13,000 talc-related lawsuits nationwide, Reuters reports. Last year 22 women were awarded $4.7 billion after they sued J&J, alleging they developed ovarian cancer because of the company's products. More than $4 billion of the jury award consisted of punitive damages, which are meant to punish a defendant for wrongdoing. J&J failed in December to convince a judge to throw out that verdict but told The Times it would appeal that decision. J&J says that decades of medical studies have demonstrated that talc is safe. "Research, clinical evidence and nearly 40 years of studies by independent medical experts around the world continue to support the safety of talc," the company says. "Talc does not cause cancer."